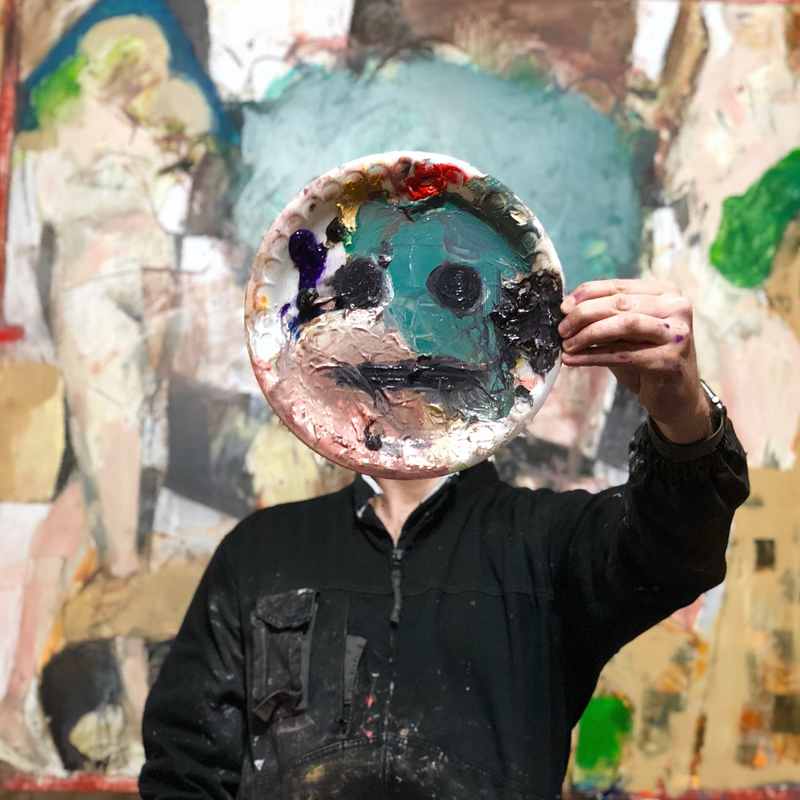 Jay Taylor is a contemporary artist, living and working in the U.K.
Everything I make is a fallible attempt to fully let go of any sense of control and explore the absurdity and delusional state of modern day life. My work starts with images or observations of everyday anxiety triggers, either from things I find in media or see in life. A new piece of work usually begins with a loose sketch, where I’m attempting to let go of all expectations of how something should be depicted and then drawing from gut instinct. Elements that I find important might be drawn in more details, whilst things that I don’t think hold the same weight are destroyed or removed. Then, all reference imagery is forgotten and I literally go with the flow of the paint, working entirely in a stoic-like state. With a dialogue of self-reflection/ destruction, there is evidence of a battle of ego within the works, as pieces are finished to an expected state, then destroyed and remade numerous times. How I paint depends on the mood that day. Some days I might feel like painting something in detail, whilst the next, I may feel like crudely destroying everything that came previous. What remains is an abstract manifestation of harmonious balance. Good and bad, right and wrong, chaos and calm, existing together in a cacophony of marks that embrace the idea of whatever happens during the process, just happens. 2013, Coventry Drawing Prize, Lanchester Gallery, Coventry. 2011, JSR, Group Show, Gallery Soho, London. Varoom, Computer Arts, Digit, Juxtapoz, Communication Arts, ISH Magazine, 3x3 magazine, Illustration Now 3, 200 Best Illustrators volume 3, How to Create a Portfolio and Get Hired.